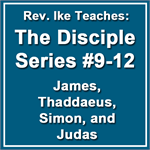 The Disciple Series: The Power is YOURS! In this amazing, 12-lesson, esoteric study now available on MP3 for the first time, Rev. Ike reveals the inner, spiritual (Mind Science) interpretation of Jesus and his 12 Disciples, as YOU and the 12 disciplines or aspects, qualities, faculties of YOUR MIND! Rev. Ike reveals the biblical basis of his teaching — you discover the spiritual (esoteric) meanings of the scriptures (the story within the story) — and you learn how to apply these teachings to transform your life! This series is going to raise your consciousness to a higher level and take you deeper into self-understanding and self-mastery! Jesus is Not Just Mary’s Baby! Rev. Ike reveals his interpretation of Jesus (the Christ) as not just a historical or theological figure. Jesus is that God-conscious mind within YOU! Jesus is the mastermind in YOU that knows who you are in God and who God is in you! Rev. Ike goes on to explain that in the New Testament, Jesus calling the 12 disciples to him represents a person (you) who comes to a consciousness of his own self-mastery. You summon the 12 faculties of your mind and "disciple" them (discipline and train them) until you become a master of your mind and it’s processes — a true master of all your affairs! As you study the highly engaging lessons in this series, you will come to recognize and gain mastery over each of your 12 mental aspects — and you will learn how to correctly apply them in your daily life in order to manifest the blessings you deserve: good health, happiness, love, success, prosperity and money! An Inside Job That You Must Do! Your job is to teach and train these disciples of your mind so that they will work for you — and not against you! And as you participate in these lessons, Rev. Ike will coach you and guide you; you will repeat dynamic affirmative treatments with him that will COMMAND and give POWER to each of your mental faculties. You will become aware of the Master Power of your own mind to create what you desire! Who Should Study this Teaching? These are practical lessons, but they are also esoteric and profound and requires some thought and listening to more than once! They will be most appreciated by those who love Jesus’ teachings — who are interested in the biblical basis of Rev. 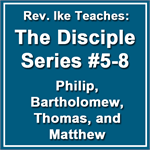 Ike’s teaching, and who enjoy discovering the spiritual (esoteric) meanings of the scriptures! This is for you, if you already have experience with some of Rev. Ike's other teachings — some familiarity with his mind science principles and techniques, and are ready to raise your consciousness to a higher level and go deeper into self understanding and self-mastery!